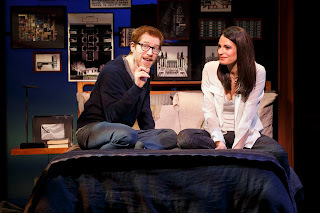 I saw the new original musical If/Then on Broadway two years ago, written by Tom Kitt and Brian Yorkey (who also wrote Next to Normal), directed by Michael Greif (who also directed RENT), and reuniting RENT's original Maureen and Mark, Idina Menzel and Anthony Rapp. 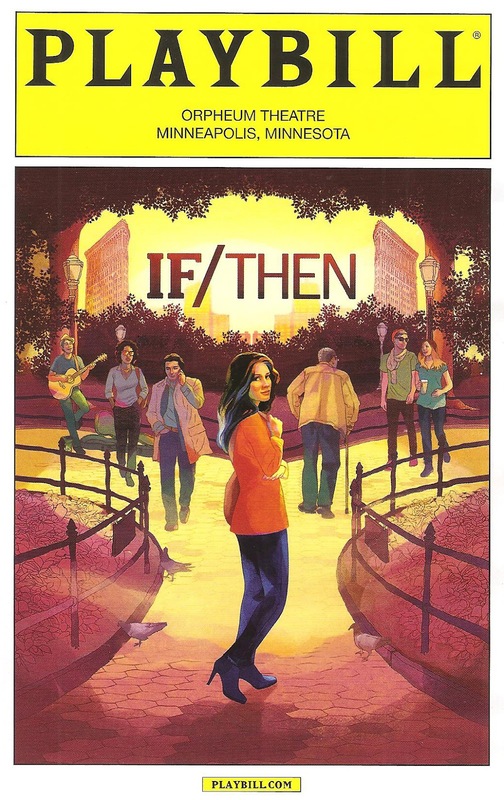 While it doesn't match the brilliance of the Pulitzer Prize winners Next to Normal and RENT (both tough acts to follow), it is wonderful to see a new, original, ambitious, modern, grown-up musical on Broadway. Seeing it on tour last night (sans Idina but still starring the wonderful Anthony), I find I enjoyed it even more the second time around. Exploring intriguing themes of fate, chance, and choice, it's about how one seemingly insignificant choice can change our lives in ways we can never comprehend. And while it can be fun, or devastating, to wonder "What If?" as this musical does, at the end of the day we are where we are in life for whatever culmination of reasons. This is the life we have to live, and the characters in this musical, despite their flaws, do it to the fullest. The messages "no day but today" from RENT and "the price of love is loss, but still we pay, we love anyway" from Next to Normal are both present in this exciting new work. The Sliding Doors-esque plot follows Elizabeth, who has just left Pheonix and an unhappy marriage to start over in New York City. She's a pragmatical cat (a woman after my own heart) who believes in facts and data and analyzing all possibilities. But that strategy doesn't work as well in life as it does in urban planning, and based on one small choice, Elizabeth diverges into Liz, who meets a handsome army doc, gets married, has children, and teaches urban planning, and Beth, who has a successful and fulfilling career as a city planner and unsuccessful dalliances with her ex and her boss. While you can't easily change hairstyles on stage like you can in a movie, you can don a pair of glasses and subtly change wardrobe pieces to quickly and easily identify which Elizabeth we're watching. The two realities are cleverly and seamlessly woven together, making it easy to follow the storylines and see the parallels in the two lives. At the most powerful moments Liz and Beth merge into one beautifully flawed, strong, very real woman, as she grapples with the choices she's made and the life she's found herself in. Stepping into Idina Menzel's Tony-nominated shoes as Elizabeth is Jackie Burns (who was the standby for Elizabeth on Broadway). I hate to say this because she is her own person, but her voice is strikingly similar to Idina's. She is a powerhouse belting out the songs of this modern pop/rock score, with some quieter moments peppered in. I especially enjoyed her take on "What the F**k?" expressing all the confusion, uncertainty, and what-the-f**kness of the moment. Besides the incredible voice, Jackie is equally funny and heart-breaking as she creates a portrait of this complicated multi-faceted woman (aren't we all?). As Elizabeth's ex and best friend Lucas, Anthony Rapp is the only original cast member in the show, returning to the role that was written for him. He's so natural and charming in the role, playing two different versions of one character, reluctantly finding himself in a happy relationship with a man in one reality, hopelessly pining after a woman he once loved in the other. But to this RENThead, he will always be Mark. The sound of his voice, every gesture of his hands, brings me right back to the musical that has meant so much to me over the last 20 years. Every chance I get to see Anthony on stage is a joy. The large and diverse (this is New York City, the most beautifully diverse place on the planet) ensemble cast is wonderful, in roles large and small. Highlights include understudy Charissa Bertels as Elizabeth's fate-believing fun-loving friend Kate, Janine DiVita as her wife Anne (their duet of the poignant "Love While You Can" is a highlight), and Matthew Hydzik as the charming and handsome army doc who wins the pragmatical Liz's heart. 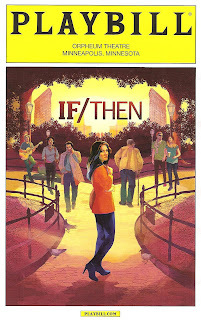 As much as anything else, If/Then is a love letter to NYC, with all its diversity, beauty, challenges, and interconnectedness. 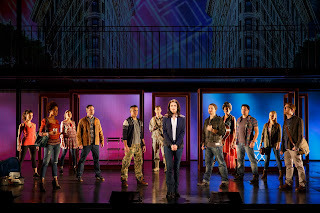 The city is well represented in the set design (which seems somewhat simplified from the complicated apparatus on Broadway) and video projections. The urban landscape can be seen in the sharp lines of the metal structures, including a walkway that lowers from ceiling to floor, and the rotating open boxes that make up Liz/Beth's apartment. Video projections of maps and skylines continue the modern urban feel, as does the simple, chic, versatile wardrobe, and choreography that's more like organic movement emphasizing the story rather than traditional dance numbers (set design by Mark Wendland, projection design by Peter Nigrini and Dan Scully, costume design by Emily Rebholz, and choreography by Larry Keigwin). It's a very tech-heavy show, which works for the most part, but I'm looking forward to when it's available for regional productions and one (or more) of our fantastic local companies can tell what essentially is an intimate story in a more stripped down way. 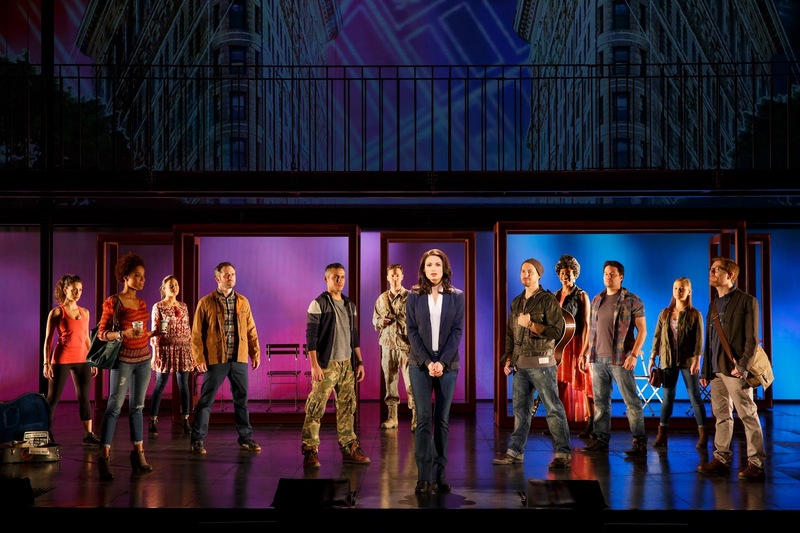 If/Then continues at Minneapolis' Orpheum Theatre through this weekend only, so make your choice now to see this new, original, exciting musical, or you might find yourself wondering "What If?"